This is the story of 1 girl living with 25 little men. 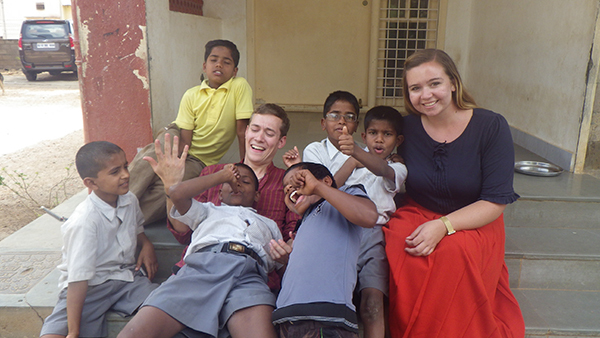 No, it isn’t an account of Snow White and her dwarf friends; rather, it’s the tale of the time I spent in rural Davangere, India working as a caregiver, English teacher, and tutor, at the Don Bosco Children’s Laborers Rehabilitation Center. Though this story isn’t a fairytale, it is a story that I hope will result in a happy ending for the children who have touched my life. 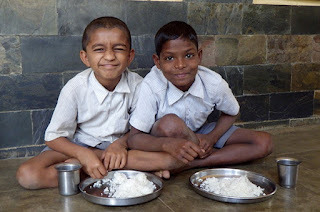 These boys, along with the 25 girls from the convent down the road have been rescued from child labor and are being rehabilitated for a year before going to school for the first time. These children have resumes longer than most people my age—construction worker, servant, brick maker, trash collector, factory worker—yet one would never know their past of abuse, addiction, slavery, and abandonment from spending time with them. 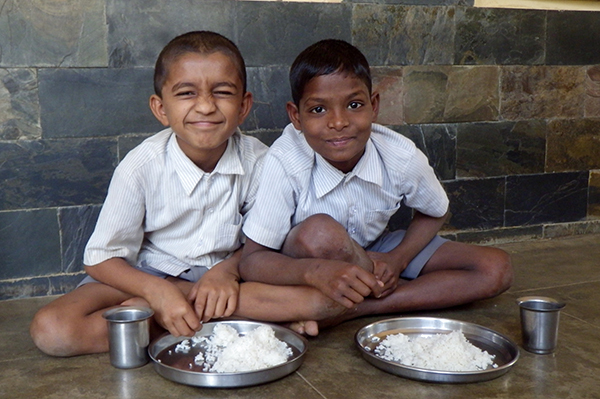 Before beginning my time in India I kept in mind Mother Theresa’s words, “living simply so others can simply life,” and when reflecting on my favorite moments at the Children’s Center, I’ve found that most of them stem from our simple moments together. Armed with only a jumbo pack of crayons, I was asked to lead art class for the kids on weekends which took some invention. Instead of drawing on paper we colored the rocks and leaves we found in the school yard. These quickly were stowed away in their lockers with their prized possessions which included anything sparkling or glittery they found (usually this was bits of candy wrappers) and bottles of crusty nail polish that they loved to paint their nails with. Though the nail polish was in short supply the boys loved to give me manicures so we could all have matching turquoise fingers. The polish was short lived however, as our right hands served as our utensils. One day Lokesh, a quiet little boy with no family, who had once asked me if I would be his mother, handed me a scrap of paper and asked me to do a magic trick with it. I turned the scrap into a paper crane and from that moment on the kids begged and begged for cranes of their own—the solution was 50 cranes made of pages ripped from my India guidebook. These children are the most devout, joyous, and caring people I’ve ever been blessed to spend time with though in their short 7-13 years of life they’ve gone through more turmoil than most have in a lifetime. Their unwavering faith despite all obstacles they’ve overcome is truly inspiring. One day I gave the kids my camera to play with during their free time. They returned it to me an hour later, its memory card filled with hundreds and hundreds of photos of crucifixes, Don Bosco images, and Mary statues that filled the compound. They fought over who would hold my hand, eagerly stuffed balls of rice from their dusty hands into my mouth, and would pick flowers to adorn my hair. What floored me most is the day a woman walked by with a basket of oranges to sell; each child has but a few cents to their name but they raced over to her goods and eagerly bought oranges to give to me. The most remarkable thing I was struck by when spending time with these kids is how incredibly smart and hardworking they are. Each day at 7 their beaming faces raced towards me to be first in line for English tutoring, shouting, “Hello sister!” or “Sister I-love-ya!,” since my name “Olivia” proved difficult to pronounce. The kids would forego bedtime T.V. in favor of more studying; every moment of freedom they tried to fill to the brim with new information. Each meal I was bombarded with “Sister! English!” as they pointed to objects around them, asking me to translate for them. The difference between “eyes,” “ice,” and “rice,” was a difficult lesson to master. Though I was there to teach the children English and art, the kids ended up teaching me more than I could have imagined. They taught me how to wash my clothes on a massive rock and beat them on the ground to ensure their cleanliness. The boy who had been saved from a leper colony (where he was assigned the job of stealing coconuts), taught me how to select the best coconuts depending on what I was in the mood for—tender coconut to drink, dehydrated coconut to munch on, or the gooey coconut to use for hair oil and eating. The boys showed me how to chase down and capture pigs and chickens. 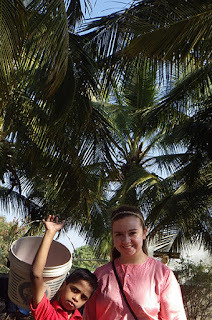 The girls taught me how to properly fix my hair, make brooms out of palm fronds, and how to crack coconuts. I learned more than just survival skills, however. They taught me perseverance, faith, and love. Little arms tattooed with names of past owners and return addresses (in the event they escaped) now lovingly embrace new brothers and sisters. Little feet once raw from working in the fields barefooted now race from class to class. Little bellies all too familiar with going without food are now filled with unending laughter. My job duties in Davangere, joyfully singing and dancing throughout the day like Maria Von Trapp with the children, or walking the girls in 2 straight lines to and from their home at the convent a la Madeline and Miss Clavele have renewed my faith and strengthened my relationship with God. My favorite moments with these children came from living simply with them, and by living modestly I have been able to more fully appreciate the children’s presence and better see the handprints they have left on my heart. Living simply means enjoying the gifts God gives us, and these children, whom I now consider my brothers and sisters, have been the greatest gift of all.